VIDEO - With a hand on her chest, 82-year-old Rivka Fringeru battled back tears as she reeled off a list of names she has rarely voiced in the past 70 years: Her father, Moshe, then her mother, Hava, and finally her two older brothers, Michael and Yisrael. All perished in the Holocaust after the Harabju family from Dorohoi, Romania, was rounded up in 1944 and sent to ghettos and camps. Only Rivka and her brother Marco survived, and like many others, they spent the rest of their lives trying to move on and forget. Now, Yad Vashem, Israel's national Holocaust memorial and museum, is asking them to remember. Decades after the Holocaust, experts have documented the names of about 4.2 million of the roughly six million Jews who were killed by the Nazis in World War II, and officials are going door-to-door in a race to record the memories of elderly survivors before their stories are lost forever. It is a painstaking process, complicated by trauma, attempted cover-ups and limited record-keeping. The Names Recovery Project has been Yad Vashem's flagship mission in recent years. It's a vigorous campaign to complete a central database of Holocaust victims' names by encouraging survivors to fill out pages of testimony about those they knew who were killed. The outreach effort has taken on a greater sense of urgency, with volunteers spanning the country to engage the fewer than 200,000 remaining survivors in Israel and etch the names of their dead relatives into the pages of history. Elsewhere – primarily in the United States and the former Soviet Union – testimony also is being collected from those unable to do so online. With the passage of the years, Fringeru's recollection of the details of her traumatic past has become sketchy, but the emotions remain raw. Her voice quavered as she tried to trace her memory, often taking a break to compose herself with a sip of water. Her voice was low and her gaze was pained as she stared at her lone memento – a faded family portrait on a cracked piece of cardboard. When she recalled the last time she saw her brother before they were separated in the Mogilov ghetto, she grabbed her chest again. "It's hard. I never thought we were going to part so quickly," she said, her voice cracking. "I wish I would have wondered with them. I wondered on my own." After the war, she moved to Israel and later married, had a daughter, two granddaughters and six great-grandchildren. On occasion, she would bring up an old memory with Marco, who died 10 years ago, but largely kept them to herself, even shielding stories from her immediate family. The memories mainly surfaced in her sleep, she said, as nightmares, and she saw no reason to delve further into them. "Why suffer? Why go back into that trauma?" Fringeru said. Now widowed, she lives with her partner Baruch Bruner, 88, a widower and fellow Holocaust survivor. Only after he sought out Yad Vashem and filled out pages of testimony about his extended family did she relent and do the same. 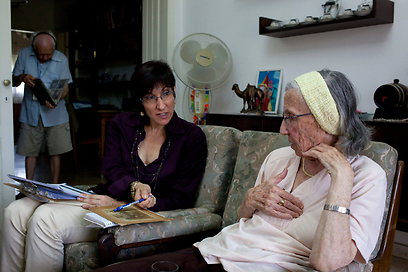 To help them through the process, the director of the names project, Cynthia Wroclawski, made a pair of house calls to their modest home in this city south of Tel Aviv. Wroclawski, who oversees a staff of some 300 volunteers in Israel, held Fringeru's hand, hugged her often and patiently waited for the details to emerge. Eventually, some did. Fringeru's father owned a grocery store, one brother was a shoemaker and had six young children who also died. The other brother's wife was named Malka. Wroclawski added each smidgen of data onto the single black-and-white page. "This is a virtual tombstone, this is a place where we can remember the person," she said. "We are bringing that person back to life in a sense, their memory at least, in the act of recording and gathering information." Yad Vashem's goal is to collect the names of all six million Jewish victims of the Holocaust. The memorial's very name – Yad Vashem is Hebrew for "a memorial and a name" – alludes to its central mission of commemorating the dead as individuals, rather than mere numbers like the Nazis did. It hasn't been an easy task. The project began in 1955, but over the following half century, fewer than three million names were collected, mostly because the project was not widely known. Many survivors refrained from reopening wounds, or they clung to hopes that their relatives might still be alive. Later, Yad Vashem began incorporating names from other collections around the world. A big boost in names came from archival sources, such as prewar census records and data derived from analysis of books, documents and tombstones. The names are commemorated in the museum's Hall of Names, a cone-shaped room whose walls are lined with bookshelves containing folders upon folders of testimonies. Still, until 2004, more than half of the allotted folders remained empty. That year, the online database was launched, providing easy access to information in English, Hebrew, Russian, Spanish and German. The number has since surged to 4.2 million names, and the Internet search function has allowed tech-savvy grandchildren to research their families, leading to several emotional reunions between relatives who had thought the other to be dead. Yad Vashem hopes that in the next five to six years, it will be able to reach the six million mark. Even the most optimistic, however, don't believe it will go much higher. Contrary to popular belief, the Nazis did not keep meticulous records. They kept tabs on the identity of Jews in Germany, Austria and elsewhere in central Europe, but ordered the wholesale murder of communities elsewhere that were not documented. They also tried to cover up many of their crimes. Yad Vashem has essentially completed its database on German Jewry during the Nazi era. Its main struggle has been documenting the victims in Poland and eastward, primarily in the former Soviet Union, the site of large scale executions and mass destruction of villages where records were not kept. Limited archival material has allowed researchers to retrace some of them, but the names of many have probably been lost forever. Because of these difficulties, the actual number of victims remains unclear. Based on records, census data, deportation orders and other documents, most scholarly research estimates the number of Jewish victims of the Holocaust at 5.5 million to six million. More estimates run higher, and some lower. The figure of six million that is commonly used is attributed to Adolf Eichmann, the mastermind of the Nazi "Final Solution" to destroy European Jewry. "Our goal is to keep collecting name after name to get as close as we can to six million and we will continue to invest time and resources into getting there," said Yad Vashem Director Avner Shalev, whose voice is often heard in radio ads beseeching survivors to come forward. "This has huge historical and emotional significance ... it makes the historical record more accurate and by having a name it helps give a human face to those who weren't treated like humans." While the main goal is for commemoration and research, Yad Vashem says the database also serves to combat Holocaust denial. The emphasis on filling out a signed testimony in person, rather than submitting a name, gives the database more detail, depth and authenticity – like sworn testimony in court. "It is of incredible importance that we have the documentation," Wroclawski said. "Usually when we are finished, you can really see that it's almost like a stone has been lifted from their hearts. They know that it is being passed on." Despite the draining effort, Fringeru said she was pleased she did it and left behind a remnant that would outlive her. "It's important that people know," she said. "I hope that now they (my family) won't be forgotten." See all talkbacks "Yad Vashem races to collect victims' names"